This painting, along with four others, is currently showing at the Jackson Gallery at the Town Hall Theater in Middlebury, VT through the month of December. 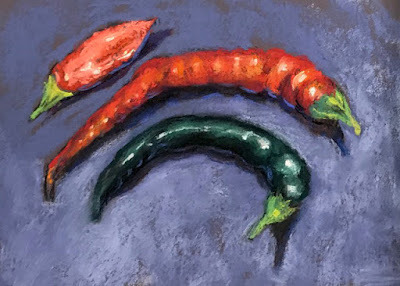 On this cold Thanksgiving Day, a few hot peppers might be welcome! Give yourself the gift of creative expression! I dare you! Take my next series of classes here in my studio in Middlebury, or give a gift to someone you love. Gift Certificates available. In this class, participants will experience a nurturing community atmosphere that will ignite artistic and personal growth whether you are a first time explorer or have had some experience. Students in this class will develop basic pastel painting techniques as we seek to discover our own style. We will explore color and composition, while refining our drawing skills.